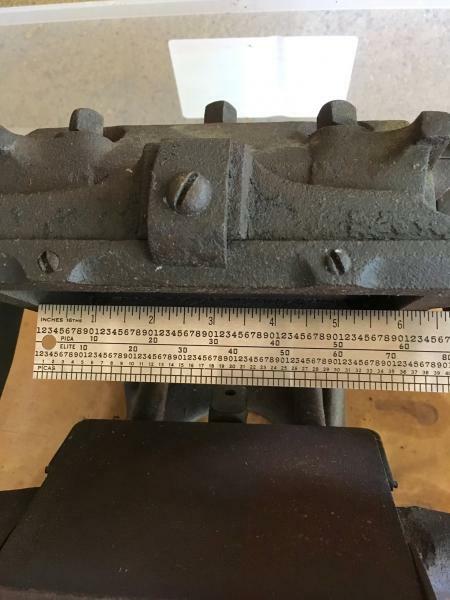 Tabletop hand-inked 4x6-ish platen press identification? 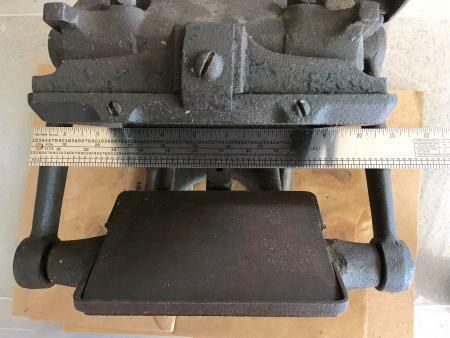 I am new to this table top press game (my only previous experience is with a Kelsey Excelsior 8x10, and even then just barely), so excuse me if I don’t know the correct terms, and/or this is some kind of weird metal stamping press. I found this little guy last weekend, a little grimy and rusty, but the action of the handle was good, and it appears to have a chase, so I bought it figuring that I could at least get some kind of impressions out of it somehow (plus it was absurdly cheap). The inside of what I think is the chase is approximately 4x6. 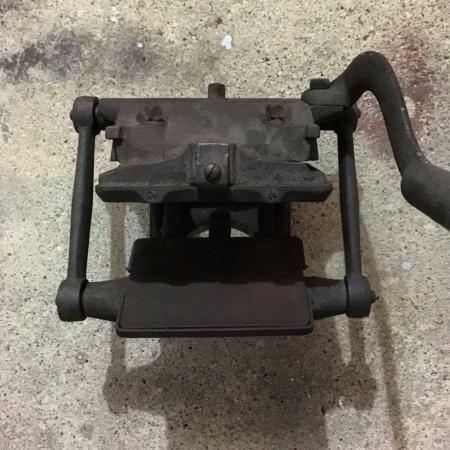 It’s around 11 inches wide and quite heavy, all cast iron. There are no markings on it except for the number 4 marked on the top. It appears to possibly be missing some pieces, but I do not think missing enough pieces that it had rollers or anything. Maybe some clips, as there’s an open place where something was screwed up towards the bottom. Any identification information would be helpful, even if it’s “hey don’t waste your time fixing this”. It has a face. And it looks like an overjoyed Hanna-Barberra character. 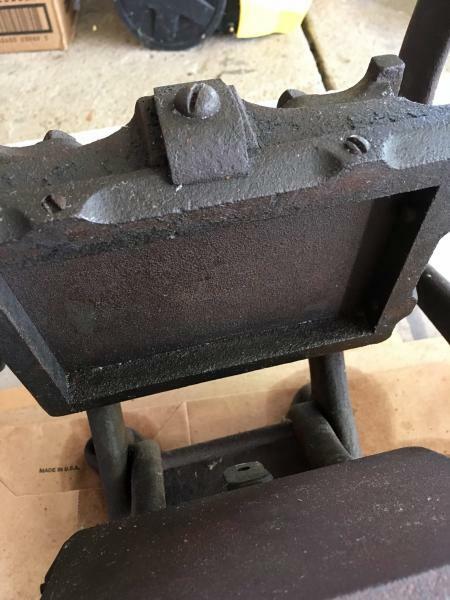 have the same press, its a Young American, made right after the civil war, around 1870, my wife bought the one I have at a yard sale near our house for $5.00. There is an ink plate that goes on the top of the press, mine is missing it too. @dickg SWEET, thanks for the info! Can you post a picture of your press? Mine was rather not as cheap as yours ($70 more). It doesn’t look like your press ever had an ink disc — there’s no support for it. 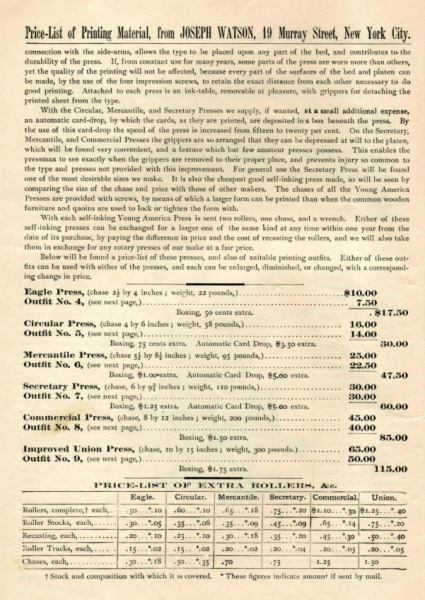 Many of those smaller old presses used hand inking with a brayer. The chase has screws for lockup instead of sacrificing space to quoins (You need two strips of flat steel about 3/4 inch wide, 1/16 inch thick and a bit less than the length and width of the chase, which is removed by loosening that screw on top). Clean it up and get a brayer and a small piece of 1/4 inch plate glass to roll the ink out on, and print with it! It may have had a gripper mechanism attached with the bracket below the platen — but you can print without that, with care. Thanks @AdLibPress, I actually just managed to carefully get those screws out of the sides of the chase (I was hoping someone would tell me that I could use this without quoins, I had read that only Kelseys had that feature, so I wasn’t going to get my hopes up) and disengage the chase itself, the inside of the screws is alarmingly clean for such an old beat press! Luckily I already have an appropriate brayer, and always some junk plate glass laying around from printing linoblock. I might have a few things I can take a hacksaw to to get the effect of the steel (I am assuming so it doesn’t damage blocks/wooden furniture?) until I find something more appropriate. I’m not looking for cleanly printed perfect miracles quite yet, but I’ll see how good/bad this little guy can print before this week is through (and before I get down to repainting it or anything crazy). I would suggest after you get it cleaned up some, find a block of 2x12 scrap (house construction sites almost always have a scrap wood pile) and screw the press down to that. It will make it stand still while printing. The steel strips are indeed to prevent the screws biting into the furniture or leads. 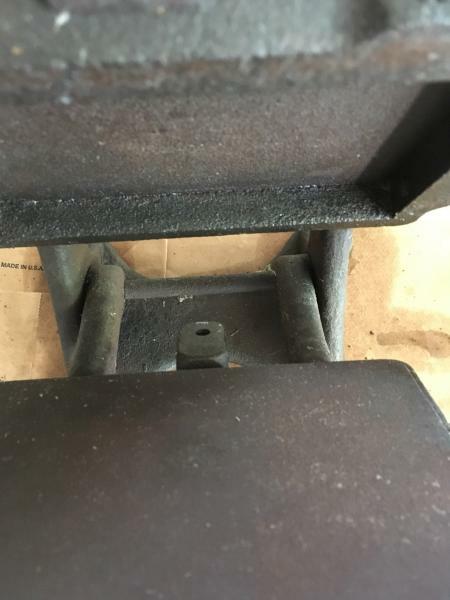 Your local hardware may have strips of flat steel bar stock like that — maybe they will sell a foot of it and you can saw off a couple of pieces. They need to be thick enough so they don’t bend when the screws are tightened. Sounds like you’re about in business. Those are indeed nice little presses, though limited. Since many moons ago we dispensed with the screwdriver slot screws, and substitute(d) with good quality *ALLEN* screws and use not just ordinary Allen keys, but Allen Keys in the form of *T* handles, you get a nice feel, when locking up or locking in. With the square headed bolts at the rear, bed leveling etc., conventional spanners/wrenches will be difficult to use, we solved this problem by using small Bi-Hexagonal sockets, with short extension bar, and tiny reversible ratchet, there would probably have been a square drive tool issued with the machine, akin to a Piano Tuners Key.??? @AdLibPress, thanks Bob! I think I have a piece of that laying around from replacing the underside of the deck. I think for the 1 color tags I am planning to make, the press will actually be OK, get me started until I want to invest more time, space and money. Eventually maybe get another Kelsey, nothing too huge or crazy. @Mick on Monotype. Good call, I’ll see what I can get, the screws on the chase are pretty nice, but the leveling screws…well, they’re another story. I was just going to try a regular adjustable wrench for now, at least to get it all re-lubed up in there. The screw on the handle just came off hand turning it. I wish I could take it apart and season it like a cast iron skillet. 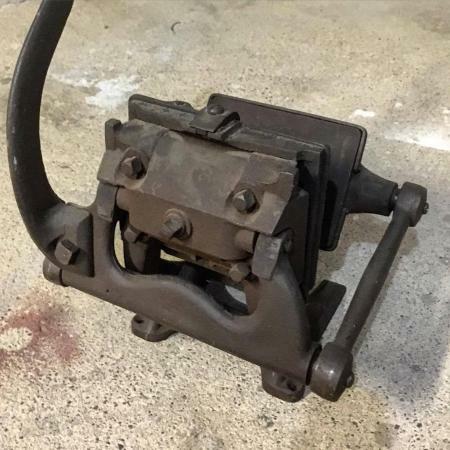 Another comment: the part on the back of the press moved by the handle may be reversible so that the handle can be on the left (more typical for a right-handed person) — many small press builders fixed their presses so that would be possible. You would have to take that piece off and flip it over to do that, and I can’t tell from the photos if that would possible, but it looks like it might. 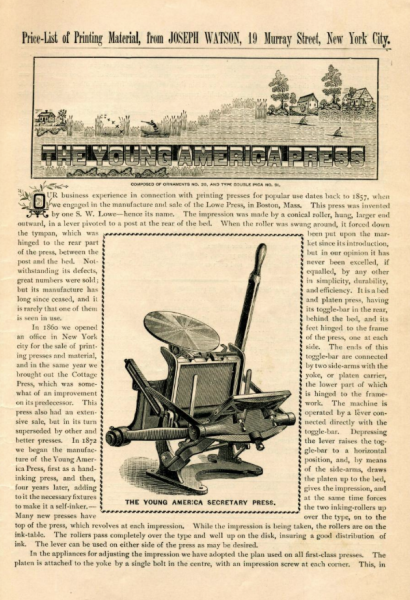 that advertisement for the young American is the next generation press, your (and mine) were made before the press in that ad, they didn’t add the ink disc and rollers until about the mid 1870s, the rights to the press were eventually sold to the Kelsey Company. @AdLibPress Well, the handle’s already off, so I’ll see if I can after work! @dickg Oh cool, so that definitely puts the press between 1871 and 1876 or so, good to have a narrower date! I don’t believe on your press you can change the handle to the other side. @dickg Nope, I definitely can’t. Took a look last night and the curve of the back plate is not symmetrical, so no can do. gravityurge, I am not good with computers, can’t post pictures, if you friend me on facebook you will see a bunch of pictures my daughter put on my page, if I can get her to sit down for a minute i’ll see if she would post a picture of the press I have like yours. Here is a Young American that is possibly the 4 x 6 “Circular” and I mounted it on a 11 x 17 board. I would love to find an original chase for it but the only one I know of is not for sale. I used the electrolysis bath method to clean it and a gear puller to push the frozen ink disk off.